Sierra Nevada Corporation (SNC) has presented an overview on the wealth of potential landing site options available to its Dream Chaser spacecraft, outlining how the company could add an array of public airports – with minimum disruption – for both nominal and emergency End Of Mission (EOM) scenarios when the primary CONUS landing sites are not available. The baby orbiter is currently embattled in a legal challenge against NASA’s decision to award continued Commercial Crew funding to SpaceX’s Dragon V2 (Dragon 2) and Boeing’s CST-100. Ironically, both SpaceX and Boeing have become somewhat mute during this challenge, while SNC have been firing out media releases portraying an active program, despite NASA’s CCtCAP decision – albeit while laying off key workers involved in the development of the spaceplane. SNC did note that Dream Chaser would live on, regardless of NASA’s decision, although she is now at the mercy of finding alternative customers in the commercial field. That, in part, explains SNC’s active media drive of late. The latest information pertains to one of Dream Chaser’s star turns, namely her ability select and land on numerous runway options, post mission. 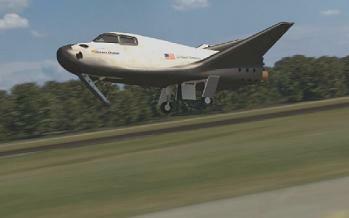 While CST-100 will land via airbags, and crewed Dragon’s are eventually expected to propulsively return to a designated landing site – after initial missions will parachute into the ocean – Dream Chaser would utilize her cross range capability and pick a runway for a post-mission scenario that mimicked her auntie, the Space Shuttle. This “dissimilar redundancy” was supposed to be a winning ticket in the eyes of NASA. Instead, the Agency opted for a future of that only involves capsules -both commercial and NASA – for its astronaut transportation needs. This week, SNC and partner organization RS&H, Inc., presented findings regarding the challenges and opportunities of landing Dream Chaser at public-use airports during the Space Traffic Management Conference at the space-famous Embry-Riddle Aeronautical University (ERAU). 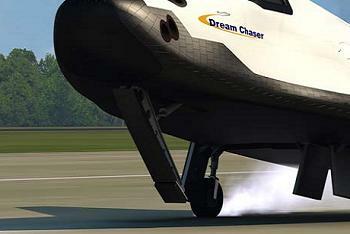 The presentation showed Dream Chaser would have the option to land at an array of options around the planet. 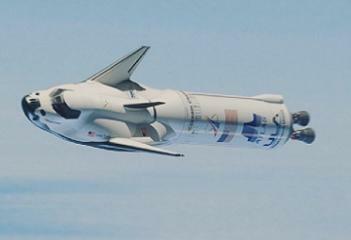 However, work analyzing the applicable standards and unique requirements that must be addressed to receive approval for Dream Chaser to land either at a spaceport or commercial airport is continuing. Although SNC summarized the findings in a short media release, the presentation has since been acquired, providing insight into the current evaluations. The key elements of the presentation noted Dream Chaser could follow in the footsteps of the Space Shuttle, a vehicle that had three primary landing sites (KSC, Edwards and the less-than-desirable White Sands) but also a multitude of alternative, emergency sites. A full landing site option overview presentation provided to shuttle crews (available in L2) showed each site – ranging from Atlantic City International to Amberley in Australia – along with a number of highly sporty landings at some exotic island landing strips – with numerous navigational aids and photography included. Most, however, were for the event of an emergency (immediate) return from orbit, something that was thankfully never required during the history of the Space Shuttle Program. 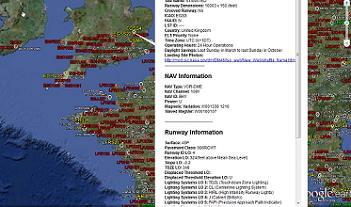 A continually updated Google Earth program (L2) – known as the complete ELS runway database – also showed thousands of landing sites across the planet, each with an array of data. Most of options were ruled out from hosting a returning orbiter, mostly due to the large runway dimensions a shuttle required when touching back down on terra firma. NASA’s Landing Support Officer (LSO) worked on color coding every runway in rank of ability for an orbiter to stand a chance of landing and coming to a stop. During the Shuttle era, NASA’s Mission Operations Directorate (MOD) briefed the teams at least once a year on what to do if a shuttle was forced to make an emergency landing. These evaluations included the basic requirements for a 1,200 feet exclusion zone while the crew powered down the orbiter, prior to the arrival of the NASA rapid response team within 24 hours. 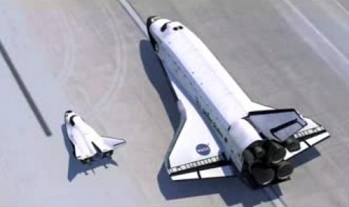 The emergency response for a Shuttle orbiter would have been far more elaborate when compared to Dream Chaser due to the major difference of the SNC spaceplane’s lack of any hazardous materials for operation. As such Dream Chaser should be able to land at any suitable runway, over 8,000 feet long, without requiring specialized equipment. Shuttle orbiters historically required a 12,000 feet long runway as a general minimum requirement, added to an array of support vehicles to care for the orbiter. According to the presentation, Dream Chaser sports a cross-range capability of 1,100 nmi for the Dream Chaser, cited as exceeding Space Shuttle performance and allowing for the vehicle to maintain at least one runway landing opportunity every orbit. 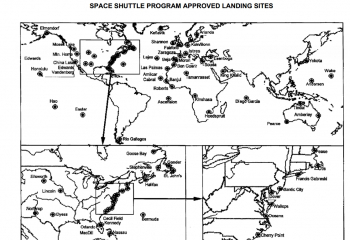 As with Shuttle, a primary landing site within the contiguous United States (CONUS) is the first priority. Dream Chaser has secured three such sites, namely the Shuttle Landing Facility (SLF) in Florida, Vandenberg Air Force Base in California, and Houston’s Ellington Airport in Texas. SNC has also initiated discussions and assessments with multiple landing sites around the world. 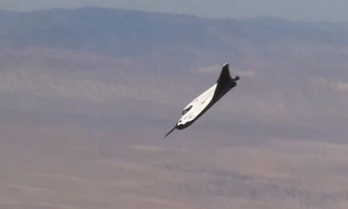 Disruption to a public airport hosting a scheduled – or unscheduled – landing of a Dream Chaser would be minimal, with SNC noting she could be removed from the runway within minutes of landing, further reducing any opportunity for landing site conflicts for nominal (planned) landing sites as well as abort or emergency (unplanned) landing sites. The presentation covers both nominal, emergency returns from orbit and also ascent aborts, with Dream Chaser enjoying continuous runway landing capability from the launch pad through the Atlas/Centaur launch vehicle trajectory. SNC are in “regular collaborative dialogue” with the Federal Aviation Administration (FAA) for the identification and confirmation of such sites. Also covered is Dream Chaser’s impressive Delta-V margins and fault tolerance Reaction Control System (RCS) to ensure the spacecraft would be able to conduct the passage towards an emergency landing site. In the emergency event of an incapacitated crew, Dream Chaser would be able to find her way home, via the use of her autoland capability. 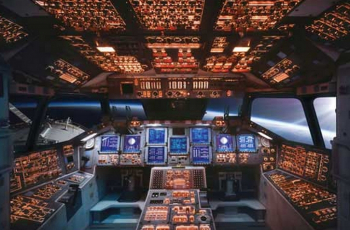 Notably, work was conducted to give the Shuttle orbiter’s such a capability (Autonomous Orbiter Rapid Prototype (AORP)/Remote Controlled Orbiter IFM cable) to end their missions without crew assistance. However, this was later explained as evaluations into the highly undesirable event of a mortally injured orbiter being able to leave her crew at the “safe haven” of the ISS, ahead of either making an “attempt” to land, or conduct a tail first destructive re-entry. An injured orbiter would have had to depart the ISS to free up the docking port for the LON (Launch On Need) orbiter. In the event of a Dream Chaser making a surprise visit to a public airport, the post landing turnaround would be speedy, per the planning that has already taken place. Following rollout, the crew would remain inside the spacecraft while she was towed off the runaway – unlike the scenario of the Space Shuttle. An option would still be available – likely in a medical emergency scenario – for the crew to egress out of the Dream Chaser after wheels stop. The return of an uncrewed Dream Chaser would require the deactivation of the Flight Termination System (FTS) ordnance – although SNC note they are looking at other FTS options that do not include ordnance. Should that “worst case” FTS solution be implemented, a post-landing Dream Chaser would require a two-person crew to install safing pins in the Safe and Arm devices for the FTS. 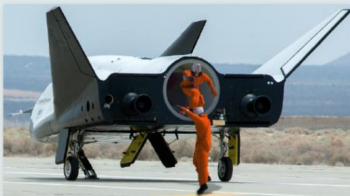 Evaluations into the timeline for a Dream Chaser landing and being successfully towed to a safe area off the runway shows the process can be completed in just 10 to 20 minutes. Other considerations covered in the evaluations note the the ideal runway options would be constructed of concrete instead of asphalt. 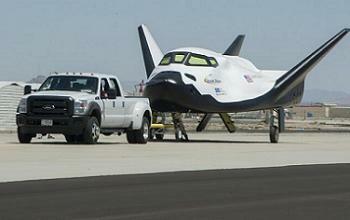 This is because an asphalt runway landing may require the modification to the Dream Chaser nose skid material. Tests of the landing skid have demonstrated that concrete runways are durable enough to withstand the vehicle’s existing skid material without causing unusual wear and degradation to the runway. 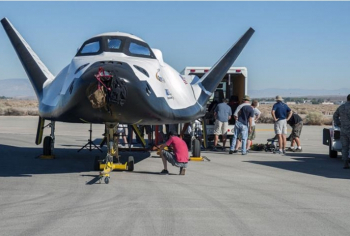 Data on the nose skid’s interactions have already been acquired during the Dream Chaser ETA (Engineering Test Vehicle) testing at Edwards Air Force Base, where the vehicle was dragged behind a truck for more than 20 miles in numerous ground taxi tow tests. This is one of the important factors a commercial airport operator would need to be consulted on, given the goal would be to free an undamaged runway in a timely manner to allow for the airport to reopen the runway for commercial aircraft. The Edwards testing noted that the nose landing skid imparted no damage to the runway, striping, or runway centerline lighting. Additionally, no damage was done to the runway when the left main landing gear did not properly deploy during the infamous landing test that ended with Dream Chaser taking a tumble off the runway. The presentation shows that despite the large amount of evaluations that have already taken place, negotiations will be required closer to the time Dream Chaser would require such landing options to become available. This includes airspace requirements, given Dream Chaser descends from orbit as a glider, with both a very high velocity and a high sink rate. This renders her incompatible with typical aircraft operations and requires special handling from Air Traffic Control facilities. Evaluations note that “all commercial aircraft operating at altitudes between 18,000 feet mean sea level (msl) (FL180) and 60,000 feet msl (FL600) are required to operate on flight plans generally under Instrument Flight Rules (IFR) requirements and must be in contact with FAA air traffic controllers. 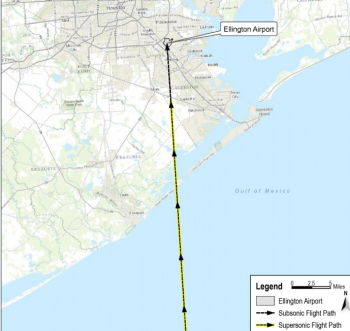 “Below 18,000 feet msl (FL180), many aircraft are not on flight plans with a mix of IFR and Visual Flight Rules (VFR) operations and, depending on the geographic area, may not be in contact with air traffic controllers. Letters of Agreement among the various controlling agencies would set pre-authorized reservations in place, allowing for commercial air traffic to be routed around the intended flight corridor until the Dream Chaser vehicle lands. Work with the FAA is expected to cover a number of certification and requirements, ranging from airspace to public safety – including the impact of the sonic boom that Dream Chaser will create to announce her return from supersonic velocities. “The need for future work in the areas of environmental analyses due to sonic boom and trajectory shaping will need to be completed to gain final NEPA approval for Dream Chaser landing at spaceport and/or public use airports, such as Ellington Airport,” added the presentation. Overall, the evaluations show Dream Chaser is likely to be able to land at public-use airports, pending negotiations, safety outlines and FAA approval.